New QLD Edition Out Now! Pay only for the postage and we'll send you a FREE copy! Need to locate or contact a private school ? The Schools Guide website is the premier directory of independent and private schools. Schools Guide covers prep and kindy through primary and secondary to Yr12. 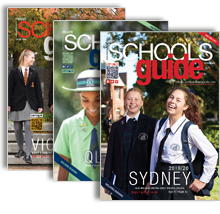 Schools Guide is recognised as the leading source of free information on private schools in Australia. This site lists every private school in Sydney, Brisbane, Melbourne, Adelaide, Perth, Darwin, Canberra, Hobart and all other towns and cities across Australia. Schools are sorted by region, city or state with a range of tools to help you find a school fast. View the Featured Schools section to find comprehensive information on a selection of the finest private schools including image galleries and upcoming events. There you can search via maps for your favourite school. Or, try our Popular Schools section to see which private schools are the most popular with other visitors. The Schools Guide provides a wide range of tools for finding private schools of any denomination. Catholic Schools, Anglican Schools, non-denominational schools, Presbyterian, Methodist and Uniting Church Schools. Steiner Schools, Muslim Schools, Christian Schools and others. Use our Advanced School Finder to search for private schools of any religion. Or, use the advanced filter tool at the top of each regional school list to find the perfect school for your child. The Private Schools Guide has been designed to be exactly what you need it to be. Whether that's a Catholic Schools guide or an Anglican Schools guide or any other type of private schools directory.